A dog rescuer and her husband were stranded without transportation on Fourth of July weekend – but when this compassionate cop heard about their mission, he didn’t even hesitate to hand them the keys to his own car. 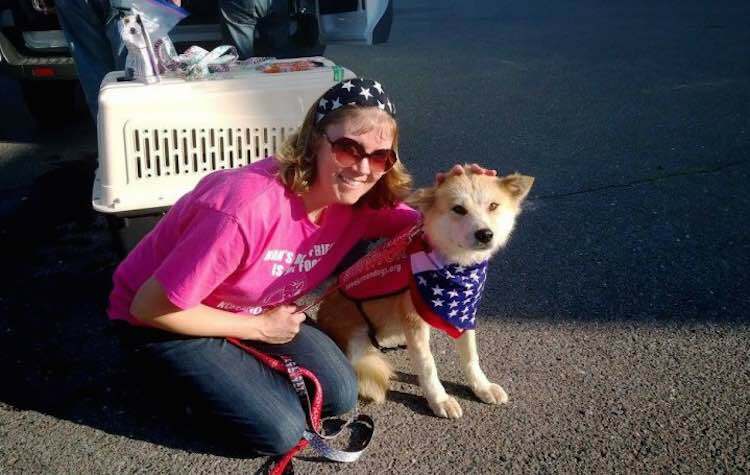 Molly Nemec and other animal rescuers have spent the last six weeks organizing the transportation of several dogs who were destined for the Yulin Dog Meat Festival in China. Earlier this month, the pups were flown into Chicago’s O’Hare airport. Nemec, who lives in Lindstrom, Minnesota, planned on meeting with her cohorts halfway in between her home and Chicago in order to pass off the dogs, who would then be distributed to their prepared foster parents in Minnesota. However, Nemec hit a pretty serious snag. While on the way to the meet-up point, Nemec’s SUV overheated and broke down in Stillwater, Minnesota. Because it was a holiday weekend, there were no rental SUVs available in the area, and they needed a car that was big enough to fit six dog kennels. Distraught, the rescuers realized that they had no way of getting to the checkpoint. Then, 47-year-old Officer Brad Junker of the Stillwater Police Department arrived on the scene to check up on the stranded couple. Nemec was so shocked by the offer, she asked if he could repeat himself. When he reiterated the statement, Nemec couldn’t help but break down in tears. Thanks to the help of Junker, Nemec’s mission was a success – all six pups were picked up in Wisconsin and dropped off with their foster parents.